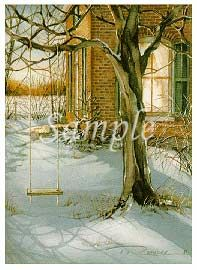 Trisha Romance Hand Signed and Numbered Limited Edition Print "Till Next Season"
Image size:11 1/2 " x 8 3/8 "
About the Print: From our dining room window at the farm, the rustic swing was always in full view. It became a place for lullabies, telling stories, watching chestnuts grow, waiting for Daddy to come down the lane. When winter came, the bitter winds would make it sway, as if beckoning us to come for a ride. But, when the still of evening crept in, and all was calm, it seemed quite content to wait "Till Next Season".